When putting together our weekly list of recommended shows for the "What's Popping" segment, sometimes we miss a hidden gem. Maybe it's because we plugged that showcase last week or we run a banner ad for the venue and don't want to over-plug. But bottom line is we would be remiss if we did not rectify the situation when it happens and tonight is definitely one of those occasions. 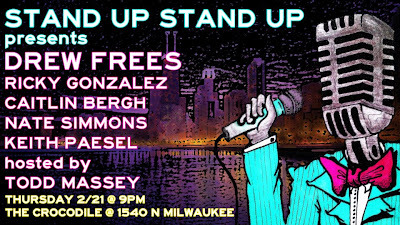 One of our favorite comics Drew Drees will be headlining a super solid lineup tonight at the Stand Up Stand Up showcase (Stand Up Stand Up has been a super consistant force in the scene recently and the producers work hard to put on a great show), which is on 1540 N. Milwaukee Ave at the Crocodile Lounge. Frees is a prolific performer with too many credits to list and is a real sweetheart with tremendous heart and talent. Also the show is FREE and you get FREE PIZZA (with any beverge). Can't really beat that folks. 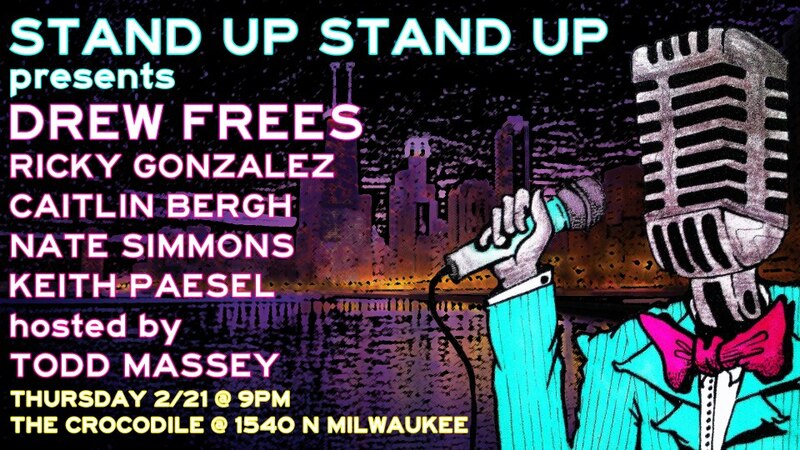 We recommend it and give props to the producers for creating an affordable opportunity for folks to check out some of the best comedy Chicago has to offer. So get out there and support. Check out the line up and PR material. 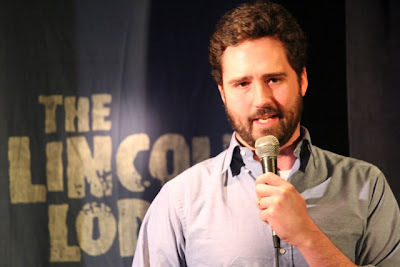 Stand Up Stand Up is a unique, hip weekly comedy showcase featuring both local and national stand up comedians and musical acts. Our goal is to provide quality, intelligent, creative, artistic, and diverse entertainment to Chicago's nightlife scene. We are located in the Wicker Park neighborhood at The Crocodile (1540 N Milwaukee Ave), and you can see us every Thursday night at 9pm. 21+. Come to laugh.